A huge thank you to Jason at Guid Scotch Drink for the sample. If you haven’t given him a read…do so. Part of the Pheasant family, Peacock’s are actually Peafowl. The word “Peacock” refers, damn appropriately I might add, only to the male of the species. The female is called a Peahen. A large group of Peafowl is called a “party”, while a smaller family is called a “bevy”. It is only the male, the Peacock, that has that bright, almost garish, stuck-in-the-80’s plumage. The Peahen prefers more sensible earth tones. Much like the residents of Michigan, Peafowl blast forth with loud, piercing cries during mating season. Those damn Norwegian Vikings pretty much had the run of the place from the late 800’s up until mid 1200. The highest point on the Island is Goat Fell (2867 feet above sea level), which derives its name from the Gaelic (“Mountain of the Wind”) and the Old Norse (“Goat Mountain”…predictably). Has a great distillery called Arran Distillery, which opened in 1995, in the town of Lochranza. Arran was founded by a former Chivas bigwig, Harold Currie, and bottled its first whisky in 1998. Eschewing chill-filtration and modern distilling practices, Arran is an independently owned, traditionally operated distillery whose bottlings over the years have won greater and greater praise. Their latest and most mature offering to date, a 14 Year Old, was just released this month. 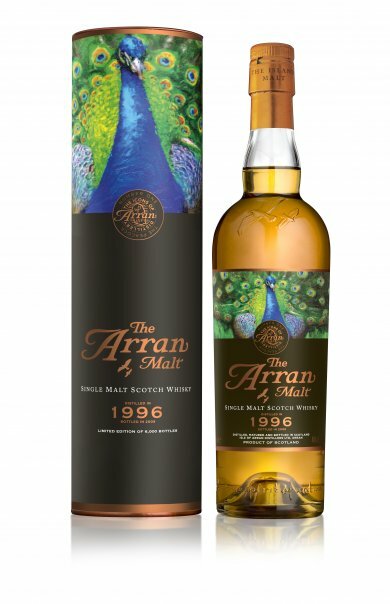 The Peacock is the first of their Icons of Arran series, distilled in 1996, matured in about 2/3 bourbon barrels and 1/3 sherry hogsheads, and bottled in a limited edition of 6000. The Nose: Really wonderful and subtle; soft, baked grain…toasted oats with a hint of cinnamon even, balanced with delicate, sherried fruit. Juicy grapes (I’d say sultanas, but I’ve never been within 50 miles of a sultana to my knowledge, so that would be improper), and baked berry dessert. A nice hint of dark, unsweetened chocolate and oak gives just enough edge to temper the sweeter notes. The Palate: Almost creamy mouthfeel that starts out emphasizing the bright, slightly bitter, zippy barley, and then builds into a really solid, deliciously spicy, baked fruit wall of oak and grain. Thinking in wine terms, I kept saying to myself, “well-built and nicely structured.” The sherry influence is mild but definitely there, showing itself subtly in the fruit and oak notes. The Finish: Nicely long, fruit, oak and grain all linger with a little brine towards the very end. Thoughts: A truly fine, expertly made whisky. While I don’t feel that it’s flavor profile is terrifically unique, at least on paper, its strength is in it balance and structure. The Peacock really seems to guide you through all the elements that went in to making it, and does so in a refined, elegant, delicious way. Sadly, this isn’t available in the U.S. but it worth a taste if you get a chance. Thanks for the plug, Peter. Glad you liked the sample. I really like that little bit of brine that creeps around the edges of a lot of Arrans.